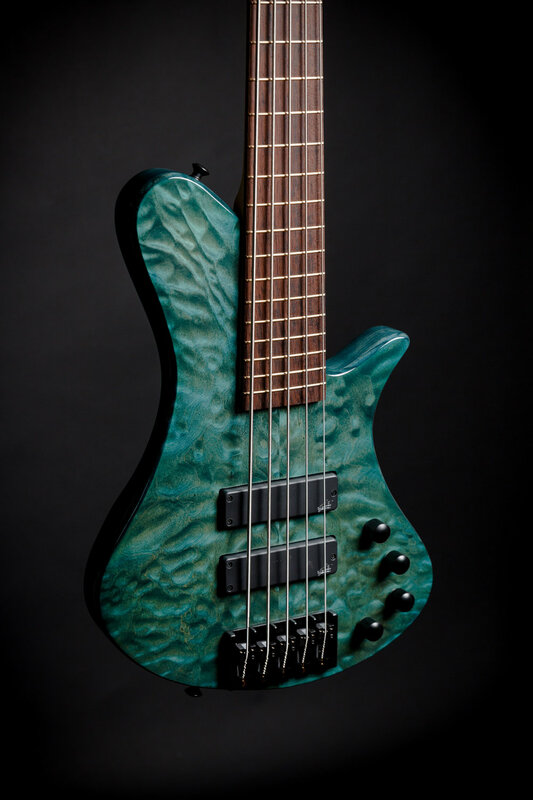 My most popular shape - the Elfin is a slightly-downsized take on the popular "Singlecut" style, originally pioneered by Fodera Guitars and Kenneth Lawrence. This compact-bodied shape is shortened, for full access to all 24 frets. The shape hugs the player and nestles into a very comfortable playing position, standing or seated. The extended upper bout supports the neck heel further than a usual double-cutaway body, allowing more contact between body and neck, and making the neck more rigid by shortening the unsupported section. A more rigid neck translates into a faster, more responsive attack, longer sustain, and deeper bass. The compact size also makes this model well-suited for heavier, denser body woods such as Hard Ash, heavier Walnut, and even Maple, allowing the player access to the tones of those woods without the excessive weight. Available in 4, 5, and 6 strings.